Aztec Civilisation took birth in the city-state of Tenochtitlan and by the time the Spaniards arrived in Americas in 1521, Aztecs had established a powerful empire in the region. They developed a rich culture which was also influenced by the classical Mesoamerican civilisations. Painting was a very important part of this Aztec culture since Aztecs did not have a written language and most of the information and knowledge was conveyed through drawings which were done on codices. Aztec paintings were a part of Aztec culture which flourished during the 14th, 15th, and 16th centuries. There were a variety of historical influences on Aztec paintings, including the influence of Olmec, Maya, Toltec, and Zapotec civilisations. In particular, the artistic traditions of the Aztecs were heavily influenced by the Toltec civilisation and the works of art were called “toltecat” by the Aztecs. Toltecs were a group of people whose city-state was destroyed in 1168 and who inspired the Aztecs by their grand architecture and works of art. Aztec culture was very religious and many paintings were of the Gods themselves who often resembled animals of various types. Aztecs made rich use of pictographs in the absence of written language. Different aspects of their history and culture were represented through Aztec drawings found in Aztec codices. For instance, one of the most famous Aztec drawings is found in Codex Mendoza which documents Aztec army conquering other city-states. The representation of the conquered city is given in the form of a toppled over pyramid in smoke and flames. 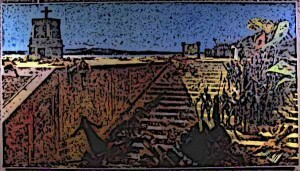 To make clear the conquest, Aztec warriors are shown with captives taken during the battle. Famous representations of various Aztec gods are also found on a variety of codices, in particular Codex Borgia. Aztec drawings made rich use of colours and symbolism. The famous types of Aztec paintings were linear drawings where lines are used to draw the characters in the image. These paintings made use of the drawing technique of precise linear contours. This type of drawings allowed representation of increased number of figures and decorative elements. Other important styles of Aztec paintings included drawing in a plane without any depth or gradation, use of round shapes, and abundant use of saturation decorative characters. Aztecs also painted different kind of masks which they wore during the religious ceremonies and human sacrifice. In Aztec drawings, a variety of materials were used some of which were not local to Aztec Empire and hence had to be traded. Common materials used for painting and drawing included coral, chalk, clay, and stone. Works of art were also decorated with precious stones and metals such as gold, silver, copper, and feathers. For instance, feathers cut into small pieces were used for the creation of Aztec mosaic paintings as decoration for shields, costumes, and fans. Other than painting in the form of pictograms and logograms on the codices, the Aztecs also painted on the walls of the temples. 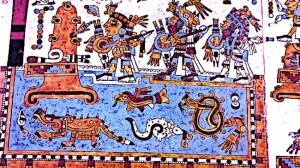 One of the most preferred painting materials colours among the Aztecs was turquoise. Aztec paintings were rich in symbolism. Some of the paintings represented simple historical facts such as conquest of another city-state which did not have much scope for symbolism. Representation of warriors fighting wars or winning a battle was an important feature of Aztec paintings and other kinds of art. Additionally, in a lot of works of art, different kinds of animals were used to represent the meaning associated with them in Aztec symbolism. This included a variety of birds, insects, fish, and animals such as dog, deer, jaguar, and snake etc. Most of the Aztec paintings had religious influences and it was common to depict gods as animals of various kinds since gods were associated with animals according to their powers and nature. Religious art also represented priests dressed as gods during religious ceremonies. Religious ceremonies were a very important part of Aztec public life and rich representations of these ceremonies in Aztec drawings exist in different Aztec codices. Abundant use of bright colours was made in the representation of gods and priests. A variety of religious Aztec paintings have also been found on the walls of the temples and the pyramids. Rich representations of Aztec gods are found throughout the Aztec art, including Aztec paintings. Gods are often depicted in the form of animals associated with their powers and nature. Art and painting in Aztec society was considered a sort of tribute to the gods. Due to this religious significance of Aztec drawings and other forms of art, a lot of art was patronised by the priests and the ruling class. Among the famous representations of Aztec gods in Aztec drawings, we can include the god of wisdom Quetzalcoatl in Codex Borgia, representation of the god of providence Tezcatlipoca in Codex Borgia, and others. Aztec painters were patronised by the rulers, the nobility, and the priestly class due to the importance and religious significance of Aztec paintings and art. The education of Aztec children included the education of art and painting because of the same reason. Other than developing their own unique methods, Aztec painters were also influenced by the neighbouring city-states, in particular the city-state of Oaxaca and the Huastec region of the Gulf Coast. Other than the temples and pyramids, Aztec drawings were also found on the walls of palaces and the residences of the nobles. Aztec emperors employed their own artists who created rich works of art including drawings. The walls of the palace rooms and courtyard were abundantly decorated with colourful murals. Additionally, bright colours were used to paint the walls and the rest of the palace. Artists were often commissioned by the emperor to produce impressive works of art. Aztecs had rich traditions of art and culture which included Aztec drawings. The culture of Aztec drawings was also important because there was no written script of their language and most of the knowledge was transferred through logograms and pictograms. Thus the education of drawing was included in the curriculum of the Aztec schools and artists and painters were patronised by the rulers as well as the nobility and the priests. Other than rich representations of art on codices, Aztecs also painted the walls of pyramids and palaces.